President Obama to visit the Israeli embassy in Washington on January 27, for ceremony honoring four Righteous Among The Nations. 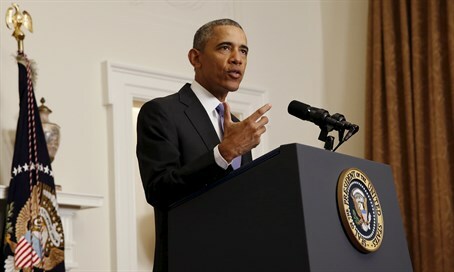 President Barack Obama will visit the Israeli embassy in Washington, D.C., on the evening of January 27, where he will take part in the first ever ceremony in the United States posthumously honoring four Righteous Among The Nations. The event is being held in partnership with Yad Vashem. Set to coincide with International Holocaust Remembrance Day, the reception will honor two American and two Polish citizens. This is the first ceremony of its kind to be held in the United States. The families of the four honorees will be in attendance, along with many other distinguished guests. The designate Righteous Among The Nations is an official title awarded by Yad Vashem on behalf of the State of Israel and the Jewish people to non-Jews who risked their lives to save Jews during the Holocaust. Persons recognized as a "Righteous Among the Nations" are awarded a specially minted medal and a certificate of honor – both bearing their name – as well as the privilege of their names being added to the Wall of Honor in the Garden of the Righteous at Yad Vashem in Jerusalem. At the ceremony on January 27, the efforts of Roddie Edmonds, Lois Gunden, and Walery and Marylta Zbijewski will be formally recognized. “It is a great privilege to recognize, on behalf of the Jewish state, the heroism of those to whom the Jewish people owe the highest debt of gratitude,” said Israel’s Ambassador to the United States, Ron Dermer. “I also deeply appreciate President Obama’s acceptance of our invitation to speak at this historic event. It will be a worthy tribute to the worthiest among us,” he added.